S.L. County mayor, faith groups declare day of observance. Their beliefs vary widely, but they share a common trait  faith  and a common concern: the future of religious freedom under America&apos;s next president. To voice their united stance, representatives of six faiths gathered Tuesday to join County Mayor Ben McAdams in declaring Wednesday Religious Freedom Day in Salt Lake County. "Faith is something that brings us together," McAdams said at the County Government Center. "It makes us feel like we have something in common and makes our community stronger." Community activist Noor Ul-Hasan organized the event in response to a growing concern over the treatment of people of various religions  particularly Muslims such as herself  since the rise of President-elect Donald Trump, who has made controversial comments about Muslim immigrants. Noor also spoke about the spike of violence, harassment and bullying against Muslims since Trump&apos;s victory. "We&apos;ve already experienced in this state some hate and discrimination issues," Ul-Hasan said. "I&apos;m hoping that, with all the religions combining and supporting together, that people will think twice about attacking faiths that may even be their faith." She and others hope county residents will show their support for religious freedom Wednesday by wearing a hijab (Muslim), yarmulke (Jewish), turban (Sikh), dot on the forehead (Hindu), headscarf (Christian) or a green ribbon. Ul-Hasan, a delegate to the Democratic National Convention, recently joined with two attorneys who announced an effort by dozens of lawyers to form a Refugee Justice League of Utah to safeguard Muslims  and others  from harassment or government overreach. "I hope and I pray to God that Donald Trump will make a very good president, and we&apos;ll all be proud of him leading this country," Pritpal Singh of the Sikh Temple of Utah said Tuesday. "I hope we will never have any repercussions for being a person of color or because of my different appearance." Other faith leaders also expressed deep concerns regarding the path the country will take during the Trump era. 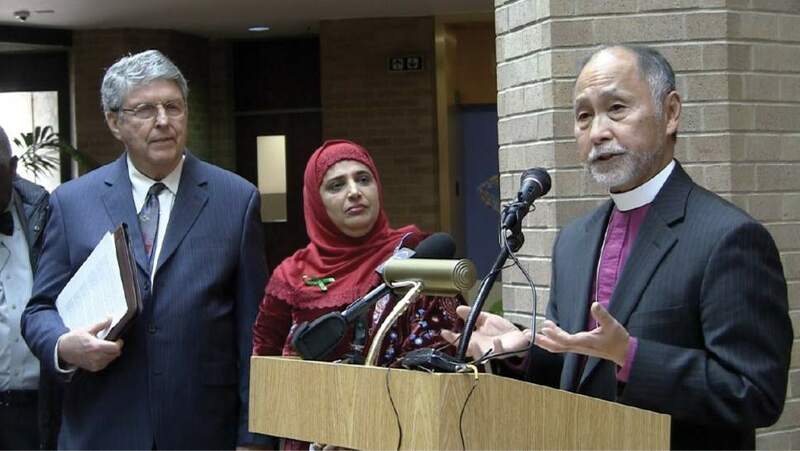 "We need to be helping each other and, in some cases, protecting each other during this time," said Bishop Scott Hayashi, leader of Utah&apos;s Episcopal Diocese. "I sense there are people who are taking advantage of the mood in the country to be very unkind to people who do not share their own religious tradition. I think it&apos;s so important that a person like me who does not experience that stands up and says, &apos;This is not right.&apos; "
Added Rabbi Emeritus Fred Wenger of Salt Lake City&apos;s Congregation Kol Ami, "I have a deep concern over President-elect Trump&apos;s statements, and I hope that his claims to represent all of us will include truly everyone, including every faith community." Also attending the proclamation reading were Neale Neelameggham of the Sri Ganesha Hindu Temple and the Rev. France Davis, pastor at Salt Lake City&apos;s historic Calvary Baptist Church. "These other faiths also have been subjected to hate in different times of their lives," Ul-Hasan said. "So it&apos;s important we remember things that have happened in history and not repeat them."